alaTest has collected and analyzed 74 reviews of ViewSonic ViewPad 10. The average rating for this product is 3.2/5, compared to an average rating of 4.3/5 for other products in the same category for all reviews. People really like the price and screen. The durability and usability are also mentioned favorably. Some have doubts about the connectivity and GPS navigation. We analyzed user and expert ratings, product age and more factors. Compared to other products in the same category the ViewSonic ViewPad 10 is awarded an overall alaScore™ of 84/100 = Very good quality. alaTest has collected and analyzed 5 user reviews of ViewSonic ViewPad 10 from Amazon.co.uk. The average user rating for this product is 3.2/5, compared to an average user rating of 4.3/5 for other products in the same category on Amazon.co.uk. Reviewers really like the touch screen and storage. The durability and usability also get good opinions, but views about the price and size are different. alaTest has collected and analyzed 12 user reviews of ViewSonic ViewPad 10 from Amazon.com. The average user rating for this product is 3.0/5, compared to an average user rating of 4.1/5 for other products in the same category on Amazon.com. Views about the size and screen are generally positive. The portability and durability also get good feedback. 58% of the reviews on Amazon.com give this product a positive rating. The compact ViewSonic ViewPad 10 dual-boots into both Windows 7 and Android, and was recently updated to jump from Android 1.6 to 2.2. Mixing a sluggish Windows tablet with an outdated Android one makes the Intel Atom-powered ViewSonic ViewPad 10 less than ideal for either OS. ViewSonic's 10-inch, dual-booting Windows/Android tablet has a lot of heart and lofty goals, and is an utter failure on nearly every front. It may be priced competitively, but the ViewSonic ViewPad 10 it doesn't come close to competing with the best tablets available. Dual-boot offers Android and Windows. Windows OS supports Flash. 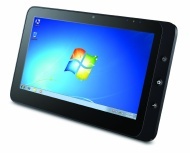 ViewSonic's new ViewPad 10pro tablet lets you easily switch between Android and Windows 7, but there's a price to pay. Hands on: ViewSonic's new capacitive touchscreen tablet offers you the choice between Android or Windows 7. Is this dual-booting Windows 7 and Android 1.6 tablet any good? Viewsonic's first seriously sized tablet, the ViewPad 10, gives a perfect demonstration of how little the right hardware really matters in this growing market.